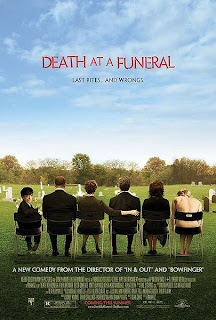 When I posted on Eulogy, someone commented that it seemed a lot like this movie, Death at a Funeral. I decided to check it out. Death at a Funeral is a dark comedy that came out in 2007. Like Eulogy, the movie surrounds the death of a family patriarch and the secrets that come out in the aftermath. The entire movie takes place the day of the funeral. The film focuses on a few of the family members. The deceased's son, Daniel is always playing second to his famous brother, Robert. He is trying to get away by moving himself and his wife out of the family home. He is to deliver the eulogy, but everyone really wants to hear from Robert. A niece Martha with her fiancee Simon are planning on using the funeral to make a good impression on Martha's father before they announce their engagement. Things start to go haywire when Simon takes a pill thought to be Valium but which is actually a designer hallucinogenic drug. Then a mysterious little person (I think this is correct term) shows up with a secret about the deceased and attempts to black mail his sons. I won't ruin the end but the trailer below gives some away. Like Euology, this film also has a similar, dramatic eulogy scene at end, and the message of the two is also similar. He wasn't perfect, but he was still a good man who loved his family and did the best he could. Below is the eulogy. "My father was an exceptional man! He may not have been a perfect man, but he was a good man, and he loved us. All I wanted to do today was to give him a dignified send-off. Is that really so much to ask? So, maybe, maybe he had some things he liked to do. Life isn't simple, it's complicated. We're all just thrown in here together, in a world full of chaos and confusion, a world full of questions and no answers, death always lingering around the corner, and we do our best. We can't only do our best, and my dad did his best. He always tried to tell me that you have to go for what you want in life because you never know how long you're going to be here. And whether you succeed or you fail, the most important thing is to have tried. And apparently no one will guide you in the right direction, in the end you have to learn for yourself. You have to grow up yourself. So when you all leave here today, I would like you to remember my father for who he really was: a decent, loving man. If only we could be as giving and generous and as understanding as my father was. Then the world would be a far better place." One of my favorite "black comedies". Another tremendous eulogy is in "Waking Ned Devine"--one man eulogizes his friend, who is sitting in the funeral pretending to be another man--very touching. Waking Ned Devine is another good one. I don't recall the eulogy scene. I'll have to watch it again. It's been a long time.